The Museum of Enamels and Mosaics of Briare deals with the industrial story of Briare’s Manufactory. It showcases mosaic pieces made with Enamels of Briare (Émaux de Briare) and also an important collection of buttons and beads. MeMo is about the industrial adventure of the Manufactory of Briare, from its birth in 1837 to its apex with Jean-Félix Bapterosses and his successors. You will see machines formerly used by the manufactory. You will also discover many archived documents about the history of the factory. For instance, a view of the manufactory at the end of the 19th century is presented as an illustration of the growth of the factory at the turn of the 20th century. You will also see machines used for the production of buttons and beads. There are also photographs of workers, engines, drafts and many other archived documents. 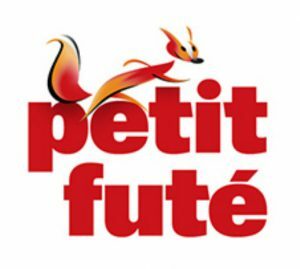 Thanks to the important collection of buttons and beads of the MeMo, you will know everything about production secrets and understand the commercial success of buttons and beads from Briare. Buttons from Briare’s manufacture. They are inserted on car stock by women. The company has been producing buttons since 1845 and has always known great success. Jean-Félix Bapterosses created a machine, a press, that produced 500 buttons at once while his rivals, the English, went on manufacturing buttons one by one. This process was a revolution for the French buttons industry, and that’s why Jean-Félix Bapterosses received the gold medal at the Universal Exhibition of Paris in 1844. 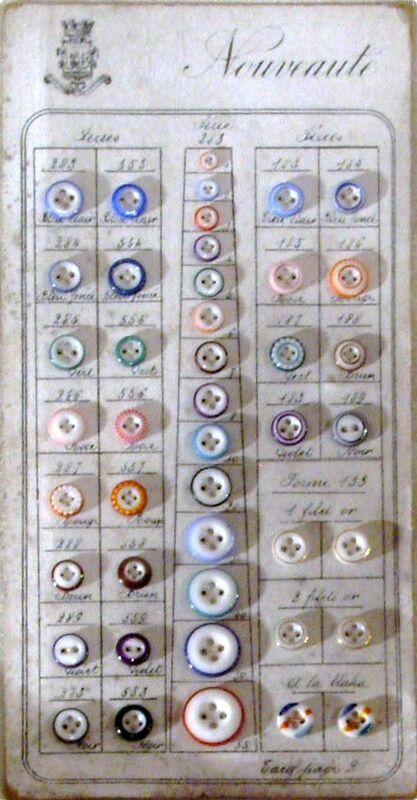 The variety of forms (with holes, “à queue”,”T” form…) and colors of Briare buttons explains their commercial success. Many local people lived thanks to this production such as women who inserted buttons on card stocks. The production of buttons stopped at the dawn of the 1970’s because of the development of plastic and of washing machines that broke buttons, as they were made of enamel. Many African ethnicities were fond of beads and they used it as finery or decoration. 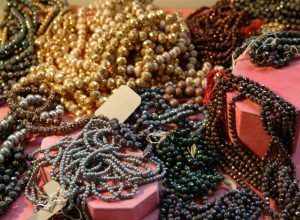 You can recognize Briare’s beads thanks to the burge located on its maximal diameter which is the specificity of Briare’s beads. Briare stopped manufacturing beads in the 1970’s following the decolonization process. Briare’s manufactory also lost American markets. Mosaic is an artistic technique used to decorate floors, walls and ceilings. It is composed of fragments of materials called tesseraes, which can be stones, terracotta, enamels, marble or shells which are assembled with mortar. The oldest mosaics known came from the ancient city of Eretria, Greece, and are dated from the 4th century BC. They were made with pebbles. Mosaic art knew three phases of development. First, it was born and came out during the 4th and 5th centuries B.B. in the Mediterranean area and then during the 11th and 12th centuries in the Byzantin Empire. Recently, at the turn of the 20th century, the art of mosaic knows a new interest during Art Nouveau or Modern Style. Enamels from Briare were created around 1885. First mosaics with Émaux de Briare were made during Modern Style (Art Nouveau). 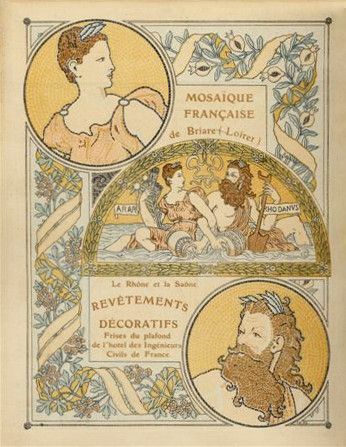 MeMo exposes a large collection of mosaics and enamels of Briare from Modern Style (Art Nouveau). 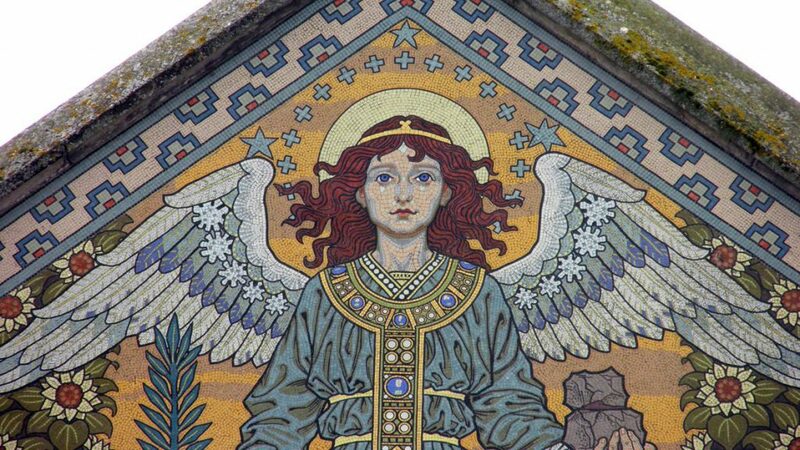 Some of the most famous mosaics were made by Eugène Grasset (1845-1917), precursor of Modern Style (Art Nouveau). He worked with the manufacture and realized many art pieces including mosaics of Saint-Etienne’s church of Briare. Saint-Etienne’s church pediment, Eugène Grasset, Briare, ca. 1890. In addition to Modern Art’s mosaics, you will discover pieces of optical art developed during the 1970s. Among them, many compositions of Victor Vasarely (1908-1997). MeMo expands its collections in a contemporary art gallery in which you could see a mosaic made by “Les Flocats” inspired by Mucha. 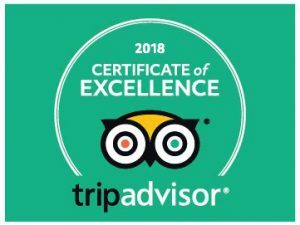 At the end of your visit, you can watch a little documentary (approx. 8 min.) showing the current production of the Émaux de Briare (Enamels from Briare).